One of the amusing things about the fast-maturing Bitcoin ecosystem is how the better-funded startups in the space are offering products that increasingly resemble services proffered by banks, the very entities they arguably are trying to disrupt. With Bitcoin, transactions can be handled anonymously and irreversibly without the need for a third-party mediator. Yet that ability also has made Bitcoin historically prone to theft. So many bigger Bitcoin startups have stepped up to offer different tiers of security. Today, Andreessen Horowitz-backed Coinbase jumps into the ring with a new product called Vault. It is complementary to Coinbase’s wallet, which is intended for day-to-day spending like a checking account. Vault would be like your savings account. There are additional verification steps, like you could require multiple parties or business partners to sign off on a transaction. 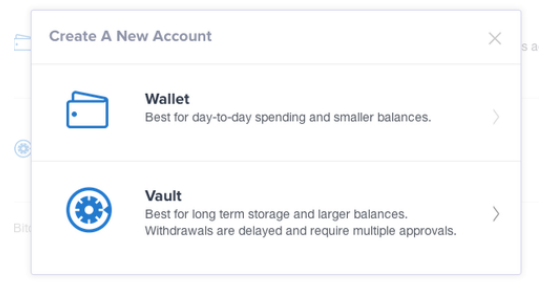 With the Vault, there’s a 48-hour delay for withdrawals during which Coinbase will try and contact the account holder through a number of channels. On top of that, you can require multiple approvals, like requiring three of five people to sign off on a transaction. Coinbase uses the same “cold storage” approach it uses with its regular wallets. They store about 97 percent of their Bitcoin entirely offline in a geographically distributed set of vaults and safe deposit boxes. Armstrong said the company will be launching “multi-sig” or multi-signature accounts soon. That’s a more secure style of storage, that other rival Bitcoin companies like BitGo have been offering for a year. Coinbase competes with other startups touting highly secure Bitcoin storage methods like Benchmark-backed Xapo, which also offers a vault that is backed by insurance. They charge an annual fee of 0.12 percent a year. Coinbase’s vault is free to use; they earn money whenever users convert Bitcoin into fiat currency.